The L.D. Kichler Co. of Cleveland, Ohio is recalling about 71,000 Kichler Krystal Ice ceiling fixtures in the U.S and Canada. The 40-watt halogen bulbs sold with the ceiling fixtures burn too hot for the electrical supply wires in the ceiling, posing a fire hazard. The fixtures also pose a fire hazard in homes with older wiring, even if used with lower wattage bulbs. 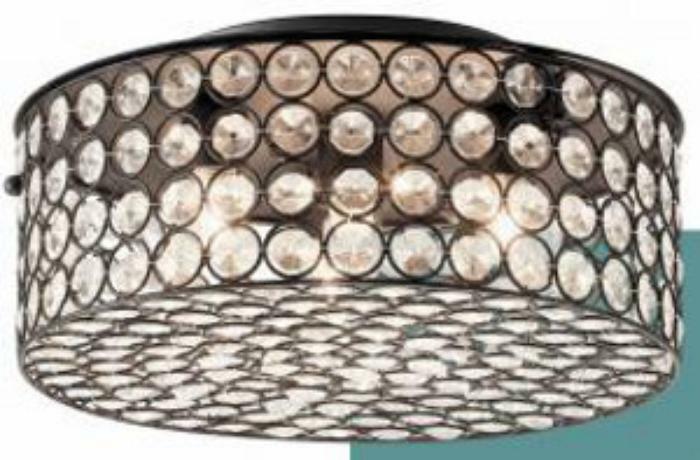 This recall involves four style numbers of Kichler Krystal Ice flush mount ceiling fixtures with square or cylindrical chrome or bronze-colored metal cage shades and clear crystal accents. They were sold with four 40-watt light bulbs. Style numbers include 38182, 38183, 38198, and 38199. The style numbers and “Kichler Home Center” are printed on the inside of the canopy. The fixtures, manufactured in China, were sold at Lowe’s from April 2015, through June 2016 and lighting showrooms from January 2016 through August 2016, for about $120. Consumers should immediately stop using the recalled ceiling fixtures and remove the 40-watt bulbs. Contact Kichler for free 25 watt bulbs and new warning labels. The new labels identify 25-watts as the maximum allowable wattage and the appropriate home wiring (90°C supply wire) for use with the fixture. Consumers with homes built before 1985 without upgraded wiring can contact the firm for a full refund. Consumers who are uncertain if their home’s wiring has been upgraded can contact Kichler for more information about an inspection by a licensed electrician. Consumers may contact Kichler at 800-554-6504 from 8 a.m. to 4:30 p.m. (ET) Monday through Friday or online at www.kichler.com and click on “Safety Information” under the “Helpful Information” section at the bottom of the page for more information.